PARIS, France (PAMACC News) - Small innovation projects by Africans in Africa are already changing lives of poor people on the ground, hence, an indication that the continent is already moving forward while at the same time offering solutions to climate related challenges. 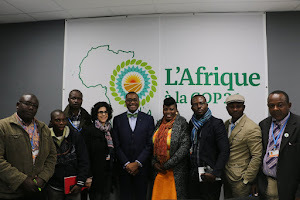 In an event at the African pavilion on the onset of the second week of climate negotiations in Paris, entrepreneurs demonstrated that it was possible and affordable to introduce people in remote rural areas to climate friendly sources of energy. From East Africa for example, Chad Larson, the Finance Director for the M-KOPA company showcased how his firm has combined innovative micro-finance system with mobile telephone money transfer to provide solar home systems to tens of thousands of poor people in the region. “Customers buy the solar home system on an affordable M-KOPA payment plan, with an initial deposit followed by daily payments for up to one year,” said Larson. After completing payments, customers own the product outright. The system, which comprises of two LED lights with switches and multiple brightness settings, one LED portable solar torch light, a phone charging USB with five standard connections, a portable solar radio, and eight watts high quality solar panel costs about $200. But since the poor residents in rural areas can hardly afford it at ago, M-KOPA Company allows them to pay an upfront fee of $30, then daily installments of $0.4 for one year. “The daily installments are far less than what many households without electricity connection spend on kerosene for lighting their homes and charging of their mobile phones,” said Larson. As a result of affordable payment plan, tens of thousands are already using the system in Kenya, Uganda and Tanzania. From the Central and Western Africa region, Thone Niang showcased how Akon Lighting Africa project has impacted communities within 15 African countries and is rapidly evolving from a pure energy access program to a wider initiative. The project strives to improve water access to peasant farmers using solar-powered water pumps, it has set up ‘climate smart’ schools in rural areas, and it is promoting capacity building with the launch of the Solektra Solar Academy in Mali. From Nigeria, Femi Oye, the Co-founder of Carbon Credit Network explained how the Social Enterprise organisation is providing low cost, clean and safe Technology (Lighting & Cook Stoves) for low income households in the country. He said that the organisation’s creatively use social marketing to economically empower its Green Ambassadors through Carbon Credit Earnings thereby lifting them out of poverty and fighting climate change in Africa. Such innovative technologies have attracted the attention of the world, with experts saying that it is a clear sign of development for Africa. “Asia and South America took off in the second half after the 20th century. And now, I believe that this is the century for Africa to take off,” said Sir David King, the UK Special Representative for climate change. He pointed out that the world has developed since industrial revolution entirely based on fossil fuel usage, but now, it is time to switch economies entirely away from the fossil fuels. “What this means is that opportunities for innovation and entrepreneurial activities are enormous,” he said. Dr Carlos Lopez, the Executive secretary - Economic Commission for Africa (ECA) said that time has come for Africa to move forward. “When it comes to industrialisation, I believe that Africa can leapfrog. But we need to empower them with renewable energy, then we can also adopt clean platforms so as to avoid repeating mistakes of others,” said. Sir King acknowledged Africa’s innovations that have shocked the world. “We have already seen how mobile phones have been taken over by Africans, and they are being utilised in Africa in a way the Western world has never seen before,” he said. He noted that Africa has already leapfrogged with the mobile phone technology and other innovations, which should be scaled up to steer development.